On Wednesday, the German government is to discuss the new proposals for energy policy revisions. The focus is on price. Craig Morris back-calculated what needs to be done to hit the government’s official targets, for instance for 2020. A draft of what will be discussed tomorrow was leaked over the weekend, and I wrote about it here. My main concern is whether it will even be possible to reach the official targets under the new proposals. So follow my math below. The official target for the power sector for 2020 is still 35 percent. Renewables made up roughly 25 percent of German power consumption (but only 23.4 percent of power generation because the country exported so much electricity) last year. So we lack 10 percent from now to 2020. Power from biomass has been growing by approximately 0.5 percentage points on average over the past five years. If we extrapolate that growth from the current nearly 7 percent, biomass will cover around 10.5 percent of demand in 2020. On the other hand, the new proposals focus on cost, and power from biomass is more expensive than wind and solar. Consider 10 percent biomass ambitious. PV covered around five percent of power consumption last year, and the ceiling of 52 GW is roughly 50 percent above current installed capacity, putting us at 7.5 percent solar power. When that ceiling is reached, probably in 2017, we still have another three years to 2020, but without feed-in tariffs for PV. Nonetheless, with system costs approaching 10 cents per kilowatt-hour and retail rates closer to 30, the question is probably whether there is any way to keep solar from growing, not whether the loss of feed-in tariffs will put an end to the market. The result could be a situation similar to the one described by Giles Parkinson in Australia, where so many people might pull off the grid that it cannot be financed in the same way it currently is. On the other hand, Gabriel seems to have come up with a way of putting and end to solar: the renewables surcharge (6.24 cents per kilowatt-hour) is to be imposed even on power that homeowners and businesses consumed directly and is never sold to the grid. Let’s assume that solar will probably not make up more than around nine percent of total power supply in 2020. That puts us at 19 percent already. Add on hydropower, which has been at 3-4 percent and going nowhere over the past few decades, and we are at 23 percent. The remaining 12 percent will have to come from wind power. Wind made up roughly eight percent, and further growth of 2.5 GW per year would add an additional 17.5 GW, equivalent to 50 percent growth. Wind power covered eight percent of demand in 2013, so that puts is exactly at 12 percent. But before you think that Germany is on course to meet its targets, consider that PV development is uncertain, especially in the world after feed-in tariffs, and the development of biomass will largely depend upon whether other bonuses are provided for the dispatchability of biomass units – the fact that they can be cut on when power is needed. The estimate for wind power is also uncertain. 2.5 GW is above the average for the past decade, and the mere implementation of a ceiling – if more than 2.5 GW of wind power capacity is installed in a given year, the feed-in tariff for everything above that threshold is to be reduced – is likely to keep investors out of the market as soon as the threshold approaches. In other words, 2.0 GW has been installed, investors will have to queue up to see whether they can still make it in before the threshold is lowered – a situation Germans have never faced. What about these 6.5 GW of offshore wind? These turbines generally run at higher capacity, so they would produce more electricity per GW installed. But it is also unclear that this target will be reached. Germany currently has only 0.5 GW installed. And if the 2.5 GW per year includes the nearly 0.9 GW of offshore, only 1.6 GW is left for onshore wind – a drastic reduction of the least expensive source of renewable power. Jörg, thanks, I had not seen that! Onshore wind: Is the 2.5 GW ceiling a net or gross value? It is an important difference. With a net value of 2.5 GW we get by simply replacing 18 GW of old turbines (1500 FLH) with modern ones (2500 FLH) additional 18 TWh production per year. This also means for 2020 – 2030 a gross value of around 4 GW installed capacity per year due to the high repowering demand, the 0.5 GW off-shore, if actually included, would not do real harm. 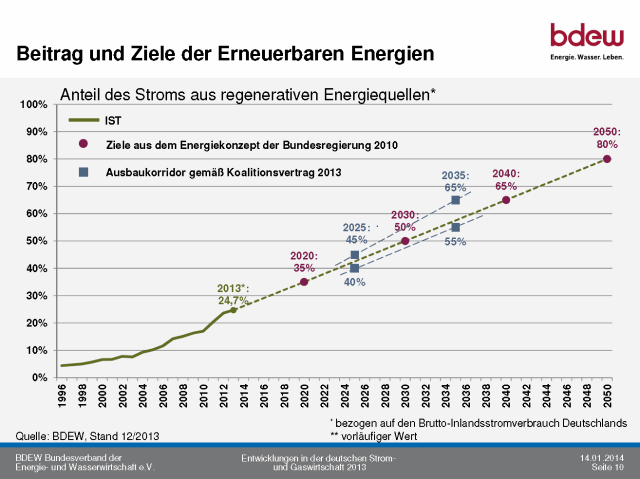 Previous PostWhat role will shale gas play in the Energiewende?